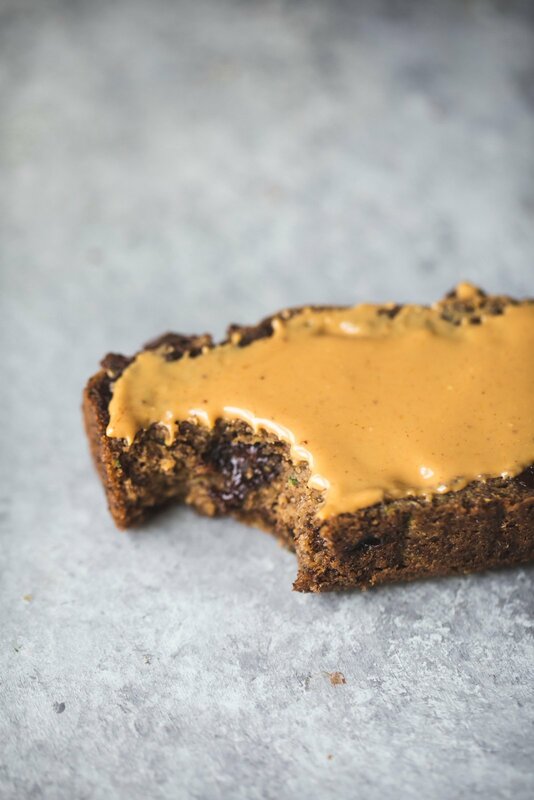 Say hello to a fan favorite on Ambitious Kitchen: this one bowl peanut butter zucchini bread. I created this recipe 3 years ago after Tony’s mom gave me 5 large zucchini from her garden. Kid you not they were the size of my arm and I’m pretty sure that was the summer #AKZucchiniWeek started. “As I mentioned previously, I’m taking a bit of time off this Summer from blogging. It’s not that I don’t want to because I basically have a million ideas, it’s more that I want to make sure I’m being fulfilled personally and professionally. So really all I’ve been trying to do is figure out what’s next for myself and AK. Do you ever find that you get caught up in unique ideas that you just say yes to them without actually thinking it through? This is me MOST of the time. I’m pretty good about testing out thoughts and running with them, but I’m also extremely obedient to my passions and recognizing when I don’t LOVE to do something. I am 100% driven by passion. I’ve always said that each year I want to do something different to challenge myself. Last year I quit my job to focus on AK full time and it’s been beyond wonderful to see it grow by providing recipes, advice and sharing food with you. This year, I’m have a few special projects happening but I’m thinking bigger. You know like, where do I want to be in 5 or 10 years sort of thing. Do I see myself still regularly blogging? Do I want to move to a different state? Do I want to move to a different country? Do I want to go back to school? It just goes to show that life changes quickly. Where I’m at now, isn’t where I was three years ago. My heart is in a different place and I’m less concerned about what’s to come next in life. I feel happy and content — thankful for what I have and patient for what’s to come. I hope this inspires you, especially if you’re feeling lost or unsure of yourself. Know that we all get that way, it’s apart of the human experience and often when we’re growing the most. Anyway, let’s get back to this bread: I have two healthy versions that I’m sharing with you today… ONE with coconut flour and ONE with protein powder! Peanut butter: I used an all natural VERY creamy peanut butter with only peanuts and salt as the ingredients. Yes, that’s the stir kind with the oil on top! The brand I use (Trader Joe’s or Smucker’s) tends to very creamy. I would not recommend using a brand like Skippy or Jif. Please stick to the all natural peanut butters. And no, Skippy or Jif Natural does not count because they add stabilizers to the peanut butter to make it thick. I think that a natural almond butter would work quite well too (if you wanted to make it paleo)! Maple Syrup: There isn’t a ton of maple syrup in this recipe, but it is necessary. I also DO NOT recommend using honey instead of maple syrup as I think the bread may brown too much when it bakes. Eggs: I have not tested this recipe with a flax or chia egg. I don’t think that you would get the best results from using those, but you can always let me know if you are willing to try it. 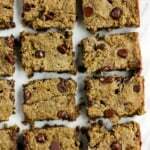 A few readers have reported using a banana and flax egg, but please refer to the comments! There are two options when you make this bread (well technically three): You can either make it with a bit of coconut flour or protein powder! It is important to note that you’ll need to use one or the other but not both. 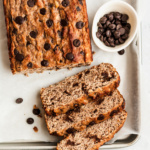 I personally LOVED the coconut flour version, but the protein version was INCREDIBLE for a protein baked good — plus I didn’t get any funky after taste from it. Update: I have also tested this bread with whole wheat flour and got amazing results. I put that in the note section of the recipe. If you go with the protein powder version: I tested this recipe with both a plant-based protein powder and a whey or dairy protein powder so that I could give you options! The protein powders I tested the recipe with were Aloha Vanilla Protein Powder (plant-based, no stevia) AND Vital Proteins Collagen Peptides. Honestly, I could not tell the difference between the two when tasting the final product. Both were amazing. If you try the protein version, be sure to let me know what kind of protein you end up using! I’d love to know. This bread is soft, fluffy, moist and creates a beautiful golden crust. 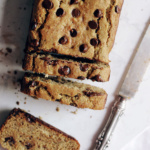 While the chocolate chips are absolutely necessary, they do enhance the sweetness (obviously?) and make it incredibly addicting. Serve it warm with a little slather of extra PB on top and I promise you’ll love me forever. If you make this bread (or them into muffins), be sure to share a picture on Instagram and use the hashtag #ambitiouskitchen so I can see it! xo. In a large bowl, mix shredded zucchini, peanut butter, maple syrup, eggs and vanilla with whisk until well combined and creamy. Stir in coconut flour OR protein powder (but not both! ), baking soda and cinnamon. You can also add in a pinch of salt if your peanut butter wasn't salted (mine was). Mix until just combined. Next, fold in chocolate chip reserving about a tablespoon for sprinkling on top. 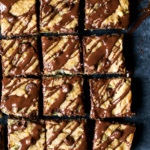 Pour batter into prepared pan, smooth top and sprinkle the tablespoon of chocolate chips on top. Bake for 40-50 minutes or until a toothpick comes out clean. The bread will develop a nice brown crust, so don't be nervous if you observe this while baking. Once done baking, remove from oven and transfer pan to a wire rack to cool for 15 minutes. Once cool enough, remove bread from pan and transfer to wire rack to cool completely. Cut into 12 delicious slices. Nutrition info is based on protein powder version. To make these into muffins, use muffins liners and spray the inside of the liners with nonstick cooking spray. Bake at 350 degrees F for 18-25 mins. Makes 12 muffins. 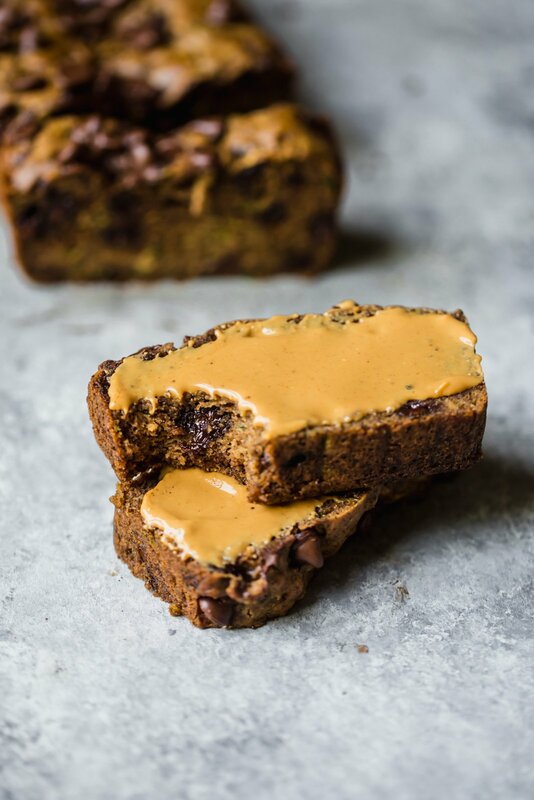 Most of the options for this bread can be found in the post text, but feel free to try this bread with almond butter instead of peanut butter if you would like a paleo version. Please do not try and sub any flours for the coconut flour or protein powder, the recipe should be made as written. I did try this bread with 1/2 cup whole wheat flour and it turned out lovely! 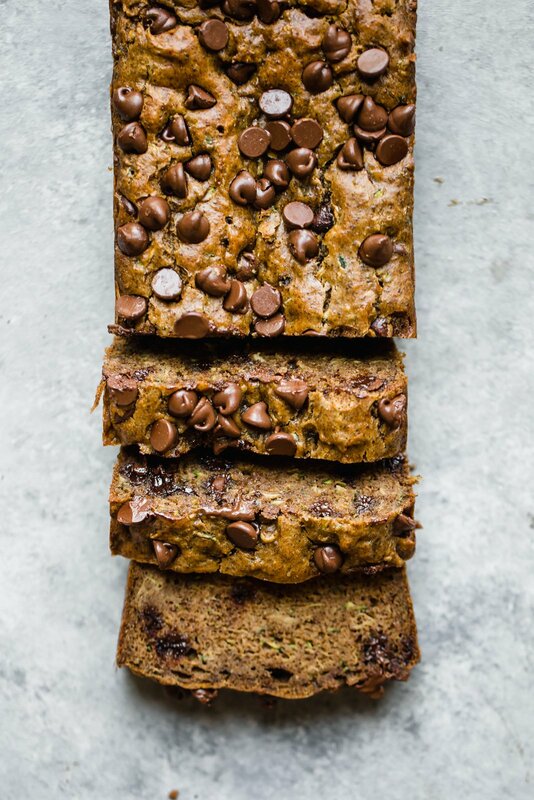 146 Responses to "Grain Free Chocolate Chip Peanut Butter Zucchini Bread (2 different ways!)" Hello my new favorite breakfast!!!! It’s great that you are taking some time to fulfill yourself! I am just learning the importance of that. BUT, I have always known the importance of getting my daily chocolate and peanut butter fix, so this bread is HAPPENING. Pinned! I make this all the time & my family LOVES it!!! It’s not overly sweet, but we think it’s delicious. I hope you try it & enjoy it! I’ve only made it with the coconut flour, natural PB & dark chocolate chips. YUM!! I’ve never baked with protein powder before and can’t wait to try these! SO COOL! This looks so delicious! I’m always looking for new bread recipes and I think I might win wife of the year if I make this! Thanks for sharing! I’m still trying to figure out how that ingredient list came up with this bread! That golden crust is perfect! And I hope the time off helps you figure things out. I agree that doing what you love matters most. I just cut back to part time with my job so that I could focus on the blog more and now there’s this internal pressure to make every post amazing. I can only imagine the pressure of doing it full time. Plus it’s like, where will blogging be in 10 years? The uncertainty of that scares me a little. I think it’s really smart that you’re taking the time to think things through now. Like you said, it doesn’t matter what you end up doing, as long as it’s driven by passion, it will be something great! Could you use sunflower butter (for a nut allergy son)? Love this!! The loaf would be gone in a day at my house! Still in disbelief over that ingredient list- This loaf screams perfection! Big props for taking a step back to reassess the future and the big plans! Regardless, passion procedes! everybody needs to have a rest once in a while!!! this bread looks amazing!! Hi Monique does the zucchini need to be squeezed of excess moisture? Hi there, I’ve been reading your blog for a while now, I’m going to give this a try, I’m intrigued to test it because it has only 2tbsp. Of coconut flour. I’m trying avoid the carb’s in grains. Thank you and when I blog about my results can I use one photo from this post to link up with? Looks yummy! Love that you have a protein powder an coconut flour version. This recipe looks yummy! Pinned! 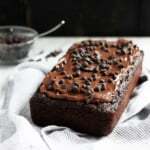 Do you think you could sub cocoa powder for protein powder or coconut flour? Hi Monique – I’ve been following your blog for some time now and have never commented. I LOVE this recipe! I made it last night using Trader Joe’s vanilla protein powder. The texture and taste were spot on, but all of the chocolate chips sunk to the bottom. Any idea how to fix it?? I plan on making this bread quite a bit! Try tossing them in the protein powder first then stirring them in. Otherwise you can use mini chocolate chips. This sounds (and looks) so good. I love the ingredient combination and will be trying this recipe for sure. And it’s great that it uses ingredients I always have on hand…and I have a feeling my girlfriends are going to love this recipe too — will be bringing this to my next party. Thank you for sharing. I made this yesterday but I made a few changes (due to the fact that I didn’t feel like going to the store). I used agave syrup instead of maple syrup (living in Canada, you’d think it impossible to run out of maple syrup, but it happens! ), and I also was out my usual natural nut butter, so I had to use my husbands skippy peanut butter. Overall it turned out really good, it just didn’t rise as well as yours, but the flavor was still really good. For the zucchini, did you get all of the water/liquid out before using it? I am assuming it would be like your other recipes where you use the colander and paper towel to dry it out. Is that right? It wasn’t necessary when I made it, but if your zucchini is watery then yes, you should. Never thought in a million years that this recipe would work, 2 T. coconut flour – c’mon?! But it does work – absolutely beautifully! Thank you so much! I double the recipe (using 3 eggs, not 4) to make 12 gorgeous muffins. To those whose chocolate chips are sinking – try mini chips! YES! So glad you loved this. xo! I made this today and baked it in two mini loaf pans! Yum! I will make this again before school starts and freeze it to have for busy mornings and to add to my kids’ lunch boxes. I did use Jif Natural’s peanut butter and subbed the maple syrup for honey and it baked up great with the coconut flour. The only other change I made was to double the cinnamon. Thanks for another great recipe. I love how your use coconut flour. Could one use egg whites I’d so how much? Or does the whole egg need to be included? Ahh! I was about to comment that I made this was recipe and that it was pretty good. I used BPI Sports vanilla caramel whey protein but I calculated less protein than you. Then I just looked at the recipe again and realized I used 2 tbsp of the powder, not 1/2 cup! I’ll have to try again using the full amount, but I’m curious how that’ll be because I thought the muffins were a good texture already. So I’m wondering if more powder will make it drier- only one way to find out. I did love the peanut butter taste! I made this recipe into muffins today for a family that I cook for.. I peeled the zucchini- in hopes that the kids would eat them sans the green flecks of skin 😉 squeezed a bit of the water out used natural almond butter & agave plus scant 2 tablespoons of sucanat because there weren’t any chocolate chips. Had to sub oat flour (used 1/3-1/2cup) they don’t have coconut flour or protein powder :-/ smelled amazing! We’ll see what the verdict is next week. Thank you for another awesome recipe! I made this with coconut flour (Costco). I used crunchy organic peanut butter (not smooth) and also doubled the cinnamon. Yumm! Thank you for the recipe! Like others, I would not have thought to combine these ingredients. Glad you were a fan. Isnt it so bad for digestion to mix two concentrated sources of protein like eggs and protein powder? If you don’t want peanut butter, will it turn out right if I just omit it? Followed instructions to the letter and I came out with a dark loaf that did not rise and was hard as rock. Sorry to hear that, sound like something was off — was your baking soda fresh? If I replaced the eggs with flaxseed or applesauce, do you think this would be too dense? I replaced eggs with mashed banana & worked perfectly. Try that? Okay I have no idea what kind of diet or thing this is, but the bread sounds good. I know I will probably go completely against the purpose of this, but can I use regular flour to bake this? I am from a small town in Europe and I am quite sure no supermarket here carries coconut flour. And I don’t even want to tey the other stuff. 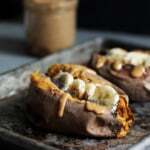 However I love peanut butter (again, we must have regular peanut butter nothing ‘all natural’ as it is not common here) and would love to try and bake this. Will wheat flour work too? I’m pretty sure you could use whole wheat flour if that’s available to you. 🙂 Try 1/2 cup whole wheat flour. I just made it with 1/2 cut whole wheat flour and it turned out great! I’ll also add another vote for mini chocolate chips. Just made this today and it’s the best flourless bread I’ve made so far – spongey and moist, quite cakey! I used protein powder – in fact it was a chocolate protein mousse powder (muscle mousse) so it contained gelatine, which I wonder if contributed to the bouncy sponginess! I’m short on peanut butter, but I have PB2, the powdered peanut butter. Do you think I could use that instead? Either way, can’t wait to try this! Did you ever try with PB2? I was wondering the same thing! I threw some chopped zucchini in my vitamix blender with a couple of TBS avocado oil and added to recipe as shredded zucchini.I mixed 2 TBS ground flax meal with 4TBS water and placed in fridge for 15 minutes to thicken in place of egg. I used unsweetened vanilla almond milk instead of vanilla extract (I was all out), and baked it in muffin tins (also greased with coconut oil) for 15 minutes.They were like buttery bread pudding muffin tops- Delish!!! 20-25 minutes firms them up a bit better- even more delish!!! I must tell you, I have made this recipe FOUR times in the past 2 weeks. I make them as cupcakes and I use unsweetened chocolate chopped up into pieces. So basically the only sweetener comes from the maple syrup, which makes this a wonderful no guilt treat! Thank you so much!! I used almond butter and added 1/4 teaspoon of baking powder because I was afraid it would be too dense. Yum! Fabulous! I made a double batch and used a honey macadamia nut peanut butter from Hawaii and mixed that with regular Jif since it was all I had. Turned out great.Thanks. Hi!! I love the recipe!! is there any way to include bananas? We had an abundance of zucchini this summer and I froze and dehydrated much of it. Do you think it would be ok to use either of them in place of fresh? I’m just concerned about it being too watery? Thanks for sharing your recipe! I used frozen and just drained off the extra liquid when it thawed. Turned out fine. These are a yummy breakfast muffin and super easy to whip up. I shredded the zucchini really fine so that even my 18mo old with veggie radar wouldn’t notice. My daughter loved them with a bit of jam. I used chocolate Harmonized whey protein powder by Progressive, which is my fave brand of protein powder. I’ll make these again for sure! Has anyone tried it with carrots instead of zucchini? Thanks for this fabulous recipe! I used Body By Vi vanilla protein powder. I added walnuts as well. It’s incredibly moist and so full of heart healthy fats. I’m so satisfied. Could rice syrup be used instead of maple syrup? Is it a cup of zucchini before or after squeezing the water out? Just baked this and it came out so delicious! I used 1/3 cashew butter and 2/3 peanut butter, and used chocolate protein powder. My boyfriend and I both love it! I just made this using the coconut flour version! The loaf is currently in the oven. I didn’t have any chocolate chips on hand, but I had plenty of Maine blueberries! So, I subbed those and then topped with sliced almonds and a light sprinkle of organic turbinado sugar. The batter tasted super yum! I can’t wait to see how it all turns out baked! Made it last night and used Plant Fusion Vanilla Bean protein powder. It’s delicious!! I just toasted a slice and had it with a cup of black tea for an afternoon snack! YUM! Amazing! What a great afternoon snack! Hi Kathy! The two flours actually have very different properties while baking, so I wouldn’t substitute. Made recipe this morning for 1ST time. Looked and smelled delicious. However, it fell to half the height it was when it came out of the oven. Wonder why? Yes, my baking soda is fresh. Any thoughts? Hi Lee! Because there’s no flour in the bread – this can happen naturally. There might also be excess moisture somewhere! AMAZING! I will be coming back to this recipe as long as my garden gives me zucchinis! I used half HardMagnum Pure & Simple protein powder & their Chocolate Peanut Butter flavour. It turned out great! This is amazingly delicious and easy to make! My bf can’t eat grains, so this is perfect for him!!! Next time, I might even try it without the chocolate! Thank for the this delicious recipe! I found this recipe last week, have already made it twice, and am craving it all the time! Next time I am going to try muffins! Amazing!! So great to hear! I was wondering if almond flower would work instead of using coconut flower?? Almond flour has a very different consistency than coconut flour (coconut flour absorbs tons of liquid!) So it wouldn’t work to substitute them. I made this last night with coconut flour. I followed the recipe and it is unbelievably good. I refrigerated the leftover loaf and heated a little piece this morning. Oh my gosh, this stuff is addicting. Thank you!! Can you sub avocado and applesauce for the eggs? Or use an egg replacer? tried it yesterday and totally loved it! I mistakenly grabbed sugar free cacao choc chips lol but it was still very delicious. I will be making another one next week with regular cacao choc. chips. Do you refrigerate your bread or just leave out? I’m so glad you loved it! It will be that much more delicious with regular cacao chips 🙂 I usually leave it out + covered with tinfoil. Hello, I just made this last night and having it for breakfast now. Delicious! But mine didn’t came out as pretty as yours as mine sink in the middle. Any idea what is the reason it sink? I did use honey instead of maple syrup and made the coconut flour version. This is amazing! I’m firmly planted in an un-ambitious kitchen, but this was easy and unbelievably fantastic with Vega All in One Vanilla Plant Based Shake Powder – thank you! I gave this a try! It was super easy to make and I LOVE the taste. But, the inside got a little soggy and is now a mushy consistency. It came out with a beautiful golden brown crust and I let it cook for over an hour, but soon the middle fell, almost like it was too moist (even though I rung out the zucchini). Any thoughts on why this might be?? I appreciate the help because I definitely want to make this again!! Hi Melissa! Very strange – I’ve never had this happen before. Did you use the coconut flour or protein powder version of the recipe? It could be the type of peanut butter you used, but I’m not 100% sure! I saw Monique make this on her insta live so I was inspired to try it! I’m not a baker so I’m always hesitant about making sweets but this was sooo easy and more importantly delicious!!!! And it made the house smell like cookies. I used two scoops of Tone It Up vanilla protein powder! Amazing! I’m glad you loved it (and yes the smell is incredible). Aw I actually remember when you first posted this recipe; I was so excited to try it I made it right away! 🙂 SO good! Can you make this without the zucchini too? I think it looks great without it but will it need more moisture if zucchini is not there? You could try 3/4 cup mashed banana, but note that I haven’t tried this version yet. We always have the natural peanut butter in our house, but my husband is a big fan of the unsalted kind. How much salt do you think I could add to the recipe to make up for it? I can’t wait to try this. Hi just wondering if the maple syrup is just for sweetness? Does it serve a function in this loaf. Can I reduce it? Hi Tracy! You can reduce to 2 tablespoons but know that the end result won’t be as sweet. So happy to hear that Cami! Thank you for being part of the AK community 🙂 Plenty more delicious recipes to come! 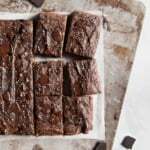 To make this recipe low carb, I substituted 1/2 C Stevia sweetener and Lilly’s Dark Chocolate stevia sweetened chocolate chips. Can I use any other sweetness?? Like spenda or stevia and what amount?? ?? I don’t bake with alternative sweeteners like splenda or stevia so I’m not 100% sure! Can you freeze the bread? So I’ve read your post twice and read all the comments to see if this has been addressed on this page but couldn’t see it mentioned anywhere. Truth to be told I’ve always had this prob when trying out recipes that list “small / medium / large *insert fruit / veg here*”. I’m usually left frustrated when the recipe does not include tge measurement either in cups or in grams (the best) as I cannot guesstimate the size! Lol. Zucchinis sold here are always around 7″-8″ long and some are fairly fat and some are thinner. Hi! Thanks so much for your note – 1 medium zucchini will be about 1 cup shredded 🙂 I’ve updated the recipe as well. Enjoy! Love this bread- can’t believe it’s grain free! I made it with one tbsp coconut flour and 1 scoop vegan protein powder, and almond butter so my daughter can take it to school for snack! Thank you! My mouth is watering! These pictures are stunning! This recipe is one of my favorites!! Any tips to stop the chocolate chips from falling to the bottom of the pan while it bakes? Thanks! So glad you love it! Coat them with flour before adding to the batter and don’t over mix. excellent. I made this low carb by using sugar free syrup and sugar free chips. Delicious treat for any meal. Since we don’t eat bread, we like a weekend treat with our protein breakfasts.